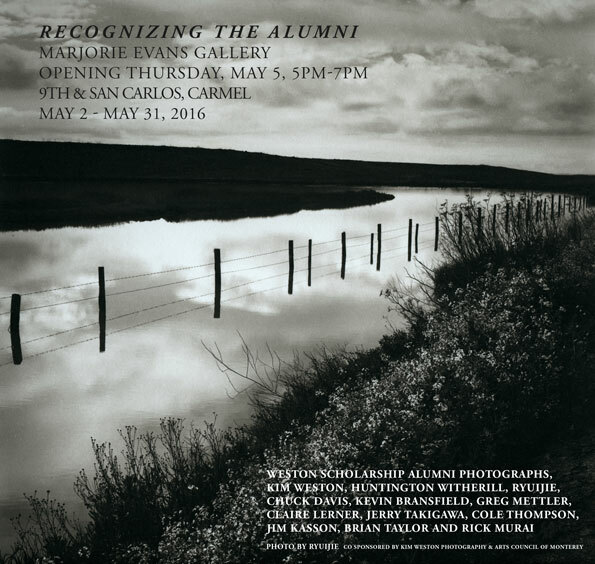 This May, the past winners of the Weston Scholarship will be sharing the Marjorie Evans Gallery with a select group of local professional photographers in a new exhibition “Recognizing the Alumni”. The WS will be showcasing prints from “The Weston Scholarship Portfolio”. A beautiful collection of top winning photographs, collected over the past 12 years, since the inception of WS in 2004. Joining WS will be local photographers, Kim Weston, Roman Loranc, Huntington Witherill, Ryuijie, Chuck Davis, Kevin Bransfield, Greg Mettler, Claire Lerner, Jerry Takigawa, Cole Thompson, Brian Taylor, Jim Kasson and Rick Murai. This May, the past winners of the Weston Scholarship will be sharing the Marjorie Evans Gallery with a select group of local professional photographers in a new exhibition “Recognizing the Alumni”. The WS will be showcasing prints from “The Weston Scholarship Portfolio”. A beautiful collection of top winning photographs, collected over the past 12 years, since the inception of WS in 2004. Joining WS will be local photographers, Kim Weston, Roman Loranc, Huntington Witherill, Ryuijie, Chuck Davis, Kevin Bransfield, Greg Mettler, Claire Lerner, Jerry Takigawa, Cole Thompson, Jim Kasson, Brian Taylor and Rick Murai. The contributions from this group comes in many forms, from teaching our students in our local schools and darkrooms, donating money to our fund, to donating prints to our fine art auction fundraisers. WS has given over $83,000 in 243 photography awards to accomplished black and white analog student photographers. The “Weston” has become a verb on the local campuses, with a buzz that circulates and excites the students. Are you entering the “Weston” is heard in the darkrooms and down the hallways. Spearheaded by Gina Weston, The Weston Scholarship has been a collaboration of many. Without the support of the local photography community, this program would not exist. The quality of craftsmanship, vision and presentation has dramatically improved over the years. We are proud of our program and hope you will enjoy the show that we are bringing to you. The WS yearly fundraiser “The New Bohemian Nights” Dinner is scheduled for Saturday, June 11, 2016. 5-8PM at Kim and Gina Weston’s home in the Carmel Highlands. Tickets are limited; a $500 donation gives you an inspiring night of photography by Kim Weston and Roman Loranc. View 4 Generations of Weston Photography, including Edward, Brett, Kim and Zach Weston. Delicious local wines by Morgan Winery, Double L Vineyard and Szalay Winery, a boutique winery run by good friends Joseph & Betty Kovacs. Appetizers and dinner will be by Michael Jones - A Moveable Feast, who won best Restaurant of 2016 in Monterey County Now! Ten tickets left. Tickets available on Eventbrite: The New Bohemian Nights Fundraiser Dinner. Each donation gives back — you will receive a beautiful original photograph from Kim Weston or Roman Loranc to take home for your collection! For more information about our fundraiser, and to purchase your tickets please visit www.westonscholarship.org or contact Gina Weston at 831.624.8111, info@westonscholarship.org. This exhibit is co-sponsored by Kim Weston Photography and Arts Council for Monterey County. Older PostSat. June 11, New Bohemian Nights - Fundraiser!